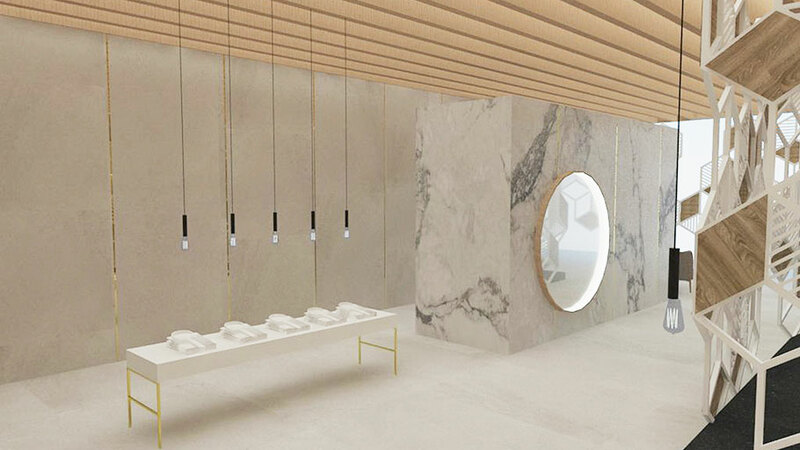 Luana García Lameiro from the Aedificare architecture studio in Muriedas (Cantabria) is the person in charge of Gatsby, a concept-store inspired by nature and a finalist at the 9th PORCELANOSA Grupo Architecture and Interior Design Awards in the Future-Professionals Projects category. The project, designed to be located on the ground floor of a building in the city centre and on a street corner, combines a men’s fashion store with a cafeteria-restaurant. Its outdoor design on two facades, for each of the two corners of the street, stands out combining two materials of great resistance and visual appeal: the KRION® Solid Surface compact mineral and the wall tile inspired by wood, Ascot from Porcelanosa. 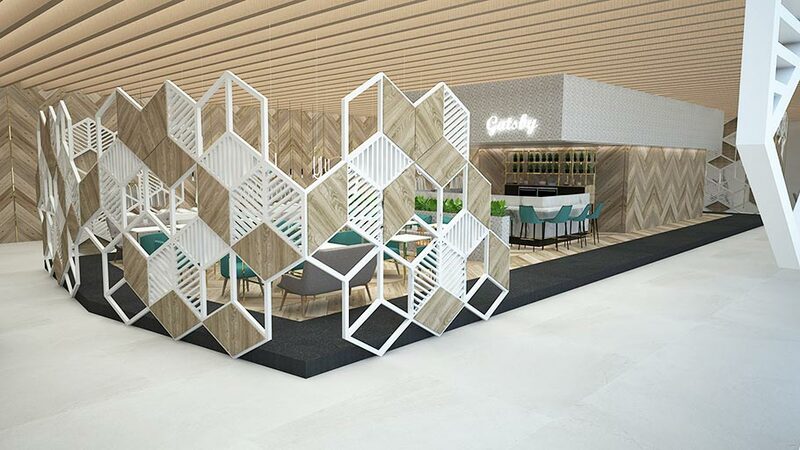 The natural essence of the project comes mainly from the design of both facades: a lattice in KRION® Snow White acrylic stone imitating a honeycomb; And another more compact in Ascot ceramics with a spike design. In the latter, the different ceramic wood tones stand out, including alternately, the five Ascot models: Maple, Gray, Olive, Oak and Teca. 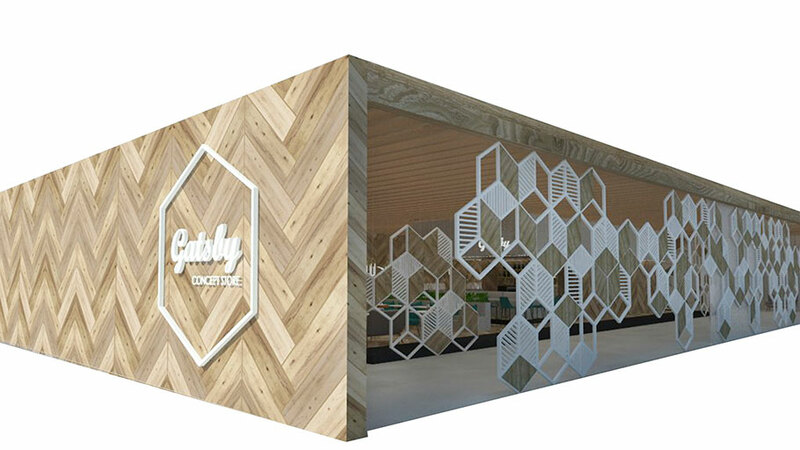 Taking advantage of the Solid Surface features, the “Gatsby” concept store logo in KRION® -Lux backlit is located on this spike façade. 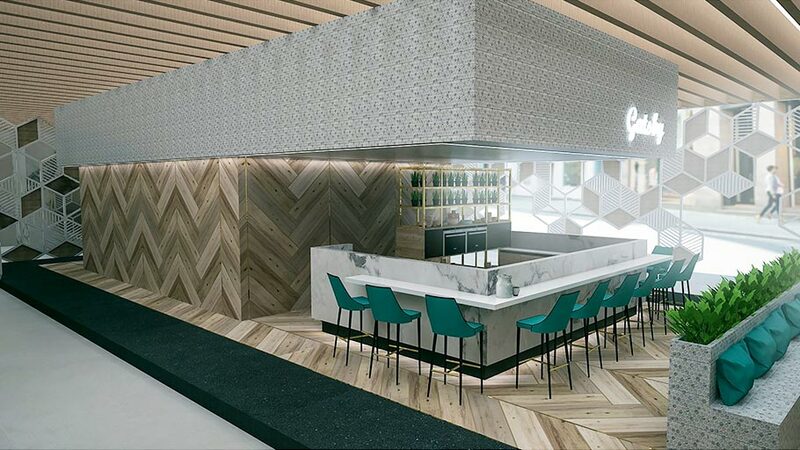 Regarding the concept store’s indoor area, this consists of a central block that houses the restaurant areas and toilets. 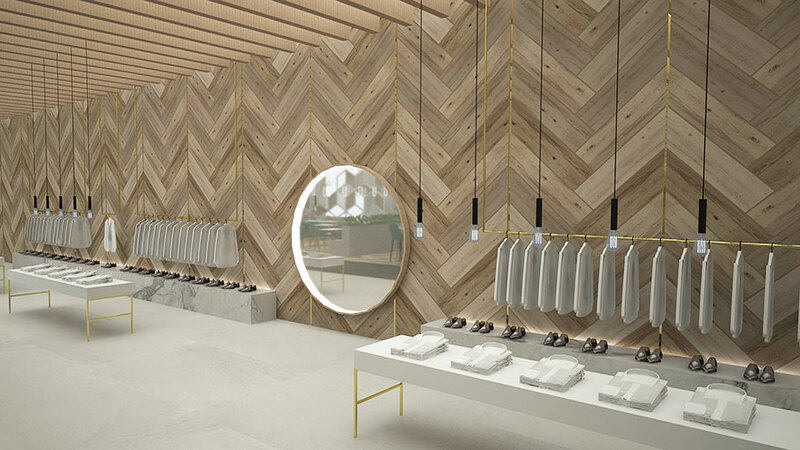 The façade lattice in KRION® is also repeated indoors, providing greater privacy in this area, while the shop area and fitting rooms are located in the store perimeter space. With regard to the materials from PORCELANOSA Grupo used in each area, we find the Par-ker Ascot model from Porcelanosa in practically all the indoor floor tiles. This comes back to being arranged in a spike format, but with profiles in a golden finish, PRO-PART GOLD finish from Butech, that dominate the space and provide an extra dose of elegance. 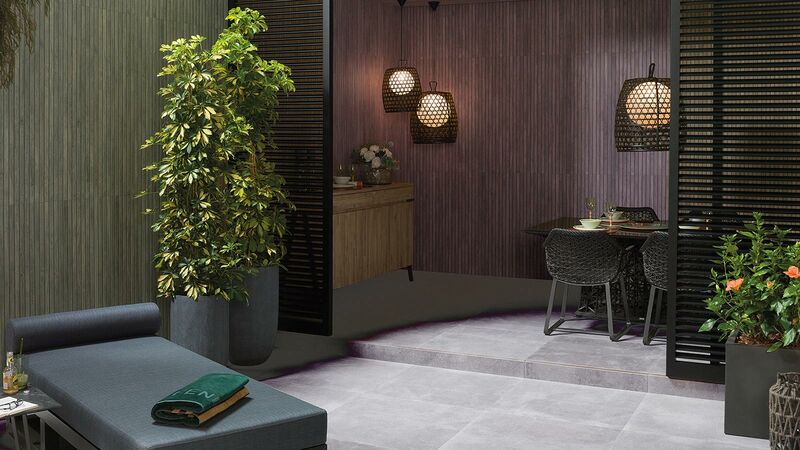 For the most demanding and highest transit surfaces, such as the perimeter area or the store, there is the extra-slim porcelain tile from Urbatek, in Stuc Black Nature and Deep White Nature models, respectively. A highly resistant and easy maintenance porcelain tile, perfectly suited for a project with these characteristics. 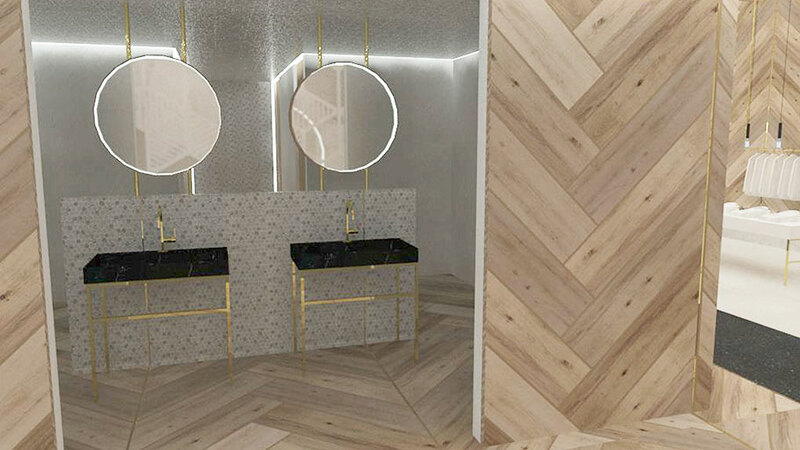 XLight from Urbatek also has the main attraction in Gatsby as a wall tile, through its model inspired by the NVY classic marble. 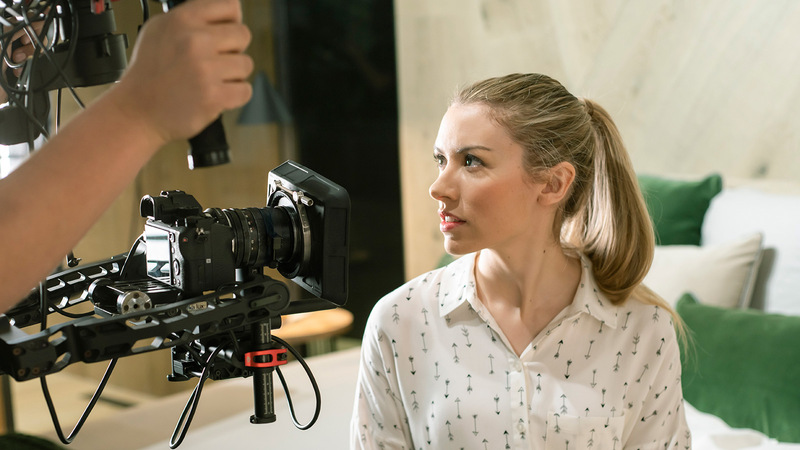 Specifically, it is located on the countertop, in the store’s backlit shoes exhibitor and in the fitting room area, including the PRO-PART GOLD finish joint end profile. The bathrooms, on the other hand, have their own and open design to the transit areas. To continue the indoors with the outdoors, the Fusion Hexagon White mosaic from L’Antic Colonial has been used in the basin area and the Oxo Spiga coating from Porcelanosa on the rest of the walls. 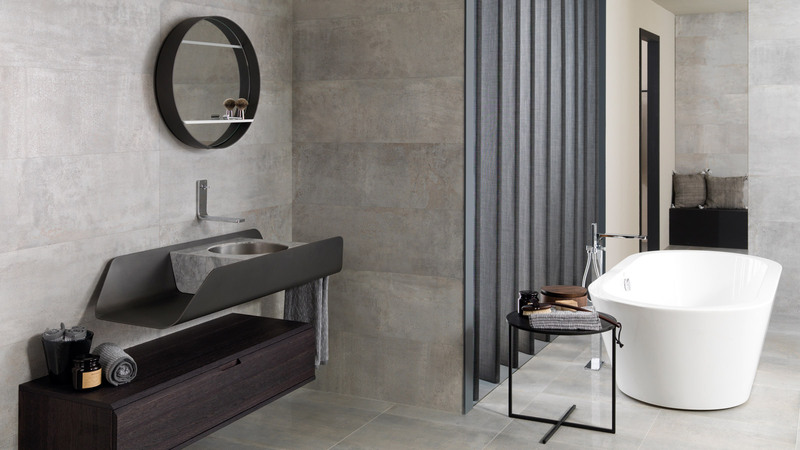 Regarding the equipment, the Mood wall-hung sanitaryware has been opted for and the Giro taps from Noken and the Basic collection basins from L’Antic Colonial. As far as the kitchen is concerned, the Evolution Emotions model from Gamadecor is available in “full view”. The chosen finish has been the Roble Alba, integrating appliances and alternating low furniture with a metallic structure area combined with the ovens in the column. The countertop and bar, on the other hand, are made with KRION Snow White from Systempool, hygienic and scientifically tested, as well as being certified for food use. A KRION® LUX ceiling alternating with small wooden beams provides a general illumination that seems to come from the street.